In May 2000, when Americans first heard the phrase "the tribe has spoken," television as we knew it changed forever. The speaker was host Jeff Probst; the television show was Survivor ; the show's creator was British-born producer Mark Burnett. Survivor was a game show like no other before it. With sixteen castaways battling to win a million-dollar prize on a deserted island, it was part athletic competition and part soap opera. Millions tuned in to watch the contestants experience conditions of deprivation, dilemma, and physical challenge. The savvy Burnett realized that the audience watching this show was the key to a gold mine, and he soon began work on other reality television series. In 2003 he produced The Restaurant, which presented the ups and downs that go into launching a new restaurant. In 2004 Burnett's "The Apprentice" drew millions of viewers as contestants vied to win a corporate position with one of America's richest businessmen. Along the way, Burnett became one of the most powerful men in Hollywood, and everyone watched as he earned the title, "king of reality TV." Mark Burnett came from a humble, but very supportive family. He was born in July 17, 1960, in London, England's East End to parents who were factory workers. His father worked in a Ford Motor Company plant; his mother worked in the battery compound next door. Although the Burnetts could not afford to give their only child a lot of material things, they did give him plenty of encouragement. Burnett's mother, in particular, served as an early role model. As Burnett recalled in his autobiography Dare to Succeed, "She always dressed immaculately, never letting her station in life interfere with how she presented herself." She passed that sense of pride on to her son, and always explained to him that he could achieve anything in life he wanted. She was also her son's biggest champion. Burnett explained in his autobiography, "Basically, she supported every crazy thing I had ever done my whole life." When he was seventeen years old, Burnett joined the British Army. In a short time, he became a section commander of the prestigious Parachute Regiment. Burnett saw active duty in Northern Ireland and the Falkland Islands, and left the army in 1982 a decorated soldier. Although he observed the horrors of war, Burnett also had his first taste of adventure, a taste that would stay with him the rest of his life. "I heard my name associated with the Peter Pan syndrome more than once. But, really, what's so wrong with Peter Pan? Peter Pan flies. He is a metaphor for dreams and faith." Not sure what to do after the service, Burnett decided to take a position as a military adviser in Central America. He did not tell his mother the full details, only that he was taking a "security job." Burnett's mother told him she had an uneasy feeling about the job, and she asked her son to reconsider accepting it. When he landed in Los Angeles, in 1982, on his way to Central America, Burnett thought about his mother's warning and decided to stay put in the United States. With $600 in his pocket, he contemplated his next move. A friend of his who was living in Los Angeles told him about a wealthy Malibu family who was looking for a nanny. Impressed by his cleaning and ironing abilities (learned in the strict British Army environment), Burnett was hired. The commando-turned-nanny worked for two different families over the course of several years. Burnett became lifelong friends with one of his employers (named Burt), and Burt eventually developed into the young man's mentor. Burnett quizzed the producers and businessmen he came into contact with through Burt, and he soaked up all the information they could offer. Eventually, Burt hired Burnett to sell insurance. During the late 1980s, Burnett went from selling insurance to selling T-shirts along a fence in Venice Beach, California, to starting his own marketing and advertising firm. By the early 1990s, the English immigrant who had come to the United States with a few hundred dollars had earned his first million. By all accounts, he was a success. However, Burnett felt something was missing. That something was adventure. In February 1991, Burnett found his inspiration. While flipping through the Los Angeles Times he happened upon an article describing a French adventure competition called the Raid Gauloises. Each year, five-person teams from various countries competed in an exotic location for up to two weeks. The race was grueling as team members competed nonstop, taking on such tasks as marathon kayaking, horseback riding (or even camel-riding, depending on the location), and parachuting. Such physically demanding competitions were not new to Europe, but the United States had nothing of the kind. Burnett decided to fix that. He would create his own competition, call it Eco-Challenge, and produce it for American television. Burnett felt he had to prepare for Eco-Challenge. As he remarked in his autobiography, "I took an unusual step. I would race in the Raid-Gauloises. This would show me how my future customers actually felt while racing, and help me become a better race producer." Burnett pulled together Team American Pride, the first U.S. team ever to compete in the Raid Gauloises. He and Team America competed in the 1992 Raid in Oman, the 1993 Raid in Madagascar, and the 1994 Raid in Borneo. By 1995 Burnett was ready to launch his own race. He formed a management team, poured every cent he had into the idea (including taking a loan against his house), and pitched the idea to several television networks. On April 25, 1995, the first Eco-Challenge was held in Utah, and broadcast on MTV. The show later migrated to the Discovery Channel and then to the USA Network. Billed as the "toughest race in the world," the first competition spanned over 370 miles across the rocky terrain of southern Utah, and included more than fifty teams. Players had to ride on horseback for 26 miles, swim in cold water carrying backpacks, and hike more than 100 miles across the desert. Some of the players did not make it and had to be flown by helicopter to safety. When an interviewer from Boy's Life asked Burnett why people would put themselves through such physical torture, he explained, "Only by taking people to their lowest low do they learn something about themselves." Mark Burnett is an inspiration story. From soldier to nanny; from salesman to producer, he is a true man of vision. As Kevin Downey of Broadcasting & Cable put it, "Burnett has a vision that strays far from the norm. Fortunately for him, advertisers and millions of viewers have turned some of his dreams into hits." According to Burnett, however, the keys to success are easy ones that everyone can follow. In his bestselling book Dare to Succeed: How to Survive and Thrive in the Game of Life, he describes seven principles that have been a guide "through the minefields dividing dreams and success." Be right or be wrong, but make a decision. Try to go above, beyond, and then further. Players kept coming back for more, and so did audiences. Burnett produced eight more Eco-Challenges, which took place in one exotic location after another, including Morocco (1998), Borneo (2000), New Zealand (2002), and Fiji (2003). Eco-Challenge was nominated several times for an Emmy award (the highest achievement in television) and received many top honors, including a 1996 Sports Emmy. Inspired by the success of Eco-Challenge, Burnett geared up to produce another competition-based series. During the course of the Eco-Challenge races, he was intrigued by how the players interacted with each other under stress. As he told USA Today online, " Eco-Challenge proved to me that the communication within groups was much more a factor in an expedition success than technical or physical attributes. And that's what attracted me to Survivor. " Survivor was actually the brainchild of British producer Charlie Parsons. Burnett purchased the rights to the idea from Parsons in 1998. As he wrote in his autobiography, "I had a gut feeling that I could make this great concept even greater." It took Burnett a few years to convince networks of his gut feeling. Network after network turned down the project until 2000, when CBS snapped it up, hoping to air it during the empty summer months when its regular line-up was in reruns. Six thousand people applied for the chance to be dropped off on a remote island in order to compete for food, shelter, and the ultimate prize of one million dollars. Only sixteen were chosen, ranging from Rudy, a retired Navy SEAL (a highly skilled military division), to a female truck driver named Susan. The men and women were divided into two "tribes," and over the course of thirty-nine days they competed in such challenges as fish-spearing, slug-eating, and running obstacle courses. At the end of each show, the losing team of the night met in tribal councils and voted off one of their own members. Survivor was an immediate and outrageous success. Viewers flocked to their sets every Thursday night to find out who was voted off, and tuned in on Friday mornings to watch ousted tribal members interviewed on radio and TV talk shows. On August 23, 2000, over fifty million people tuned in to watch the series finale. The show's winner, Richard Hatch, became an instant celebrity; producer Mark Burnett became a multi-millionaire; and Survivor went down in pop culture history as the most successful reality show of all time. 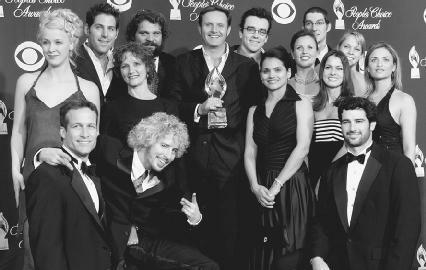 Mark Burnett (center) and the cast of Survivor: Pearl Island pose with their 2004 People's Choice Award. attracted record numbers of viewers. In December 2003, when Survivor: Pearl Island (the seventh installment in the series) ended, it was the second-most watched program on network television. In May of 2004 more than twenty-four million viewers saw Amber Brkich named the winner of the Survivor: All Stars competition, which set eighteen past cast members in competition against one another. In addition to its popularity with audiences, Survivor received praise from critics and was nominated for fourteen Emmy awards, winning two. Perhaps the real mark of success was that Survivor spawned a number of imitators, including Big Brother and Joe Millionaire. Such shows hoped to cash in on the reality craze, but none even came close. Burnett was not yet finished riding the reality show wave. In 2003 he took his cameras to Oahu, Hawaii, and introduced viewers to the world of professional surfing in Boarding House: North Shore. He also gave us a behind-the-scenes look at the restaurant business while following up-and-coming New York chef Rocco DiSpirito in The Restaurant. Neither show had quite the draw of Survivor. In 2004, however, Burnett moved from the island jungles to the concrete jungle in The Apprentice. And, once again, he hit the jackpot. On the surface, The Apprentice sounded very much like Survivor : sixteen contestants picked to compete in a number of challenges to win a grand prize. In this case, the contestants were men and women with backgrounds in business, the playing field was set on the streets of New York City, and the winner got the chance to work for Donald Trump (1946–), a U.S. real estate whiz who is estimated to be worth approximately $4 billion. Burnett was a longtime fan of Trump, and in 2002 he got the chance to meet his idol when he leased the skating rink in Central Park for a Survivor finale. Trump owns the rink (as well as many other New York City landmarks), and the two got to talking. They both agreed that a competition set in New York would be perfect since, as Trump remarked to Entertainment Weekly, "New York City is the toughest jungle of them all." Over the fifteen episodes, two teams (men versus women) competed to see who was the best at selling lemonade, designing ad campaigns, and renting high-priced apartments. At the end of each show, instead of gathering at a tribal council, the losing team met with Trump in the "boardroom." Just as millions tuned in to watch Jeff Probst extinguish a tribal member's torch, millions more tuned in to watch Trump flick his wrist, point at the losing player, and say, "You're fired!" By the series end, the contestants had again become celebrities, as fans rooted for the conniving Omarosa, mild-mannered Kwame, and spastic Sam; the network and Burnett were taking home barrels of cash; and Burnett cemented himself as the guru, the titan, the king of reality TV. Following the success of The Apprentice, Trump wrote in Time that "Burnett is a great visionary, able to see into the future with far better accuracy than any of his competitors. His No. 1 talent is having the right idea at the right time.... The positive impact of his efforts has been seen and felt by tens of millions of people." In interviews Burnett acknowledges that he has tapped into a new type of television producing, but he bristles at the term "reality TV." As he told Josh Mankiewicz of Dateline NBC, he prefers to call his creations, "unscripted dramas." Regardless of what they are called, there seems to be no end to them. In March 2004, Burnett launched a program called Recovery, which follows a CIA agent who recovers abducted children. Premiering in June 2004, The Casino follows two entrepreneurs who purchase the failing Golden Nugget Hotel and Casino in Las Vegas, Nevada, in the hopes of resurrecting its glory days. Burnett is also producing The Contender, along with actor-director Sylvester Stallone (1946–). The focus of the show is a nationwide search for the next boxing superstar. 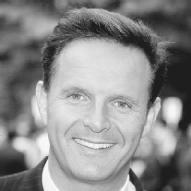 By 2004, forty million people were watching Mark Burnett–produced shows every week on at least three major networks. He was also a best-selling author, a motivational speaker, and he appeared on almost every "who's who" list imaginable, from " Entertainment Weekly's Top 101 Most Powerful People in Entertainment" to " TV Guide's Most Valuable Players" list. In his spare time, Burnett was active in a number of charities, and he remained a top-notch athlete: he is a certified scuba diver and an advanced-level skydiver. What is Burnett's message to adventurers out there? As he told Josh Mankiewicz of MSNBC, "There's nothing like biting off more than you can chew and chew it anyway." Burnett, Mark. Dare to Succeed: How to Survive and Thrive in the Game of Life. New York: Hyperion, 2001. Armstrong, Jennifer. "Donald's Kids: Sixteen Go-Getters Will Do Anything to Land a Job with Trump." Entertainment Weekly (December 19, 2003): p. 64. Boga, Steve. "Challenge of a Lifetime." Boy's Life (August 1996). Downey, Kevin. "A Dreamer of Real Dreams: Burnett Launched a Television Genre and Has Seen It Gain Respect." Broadcasting & Cable (January 19, 2004) p. 10A). Poniewozik, James. "The Art of the Real: Donald Trump Doesn't Hand Out Roses, But He Does Break Hearts on the Reality Showdown 'The Apprentice.'" Time (January 12, 2004): p. 69. Trump, Donald J. "Mark Burnett: The Guru of Reality Television." Time (April 26, 2004): p. 95. The Apprentice Web site. http://www.nbc.com/The_Apprentice (accessed on May 29, 2004). Mankiewicz, Josh. "Mark Burnett: Mr. Reality TV." MSNBC: Dateline NBC (April 16, 2004). http://www.msnbc.msn.com/id/4740184 (accessed on May 29, 2004). Survivor Web site. http://www.cbs.com/primetime/survivor8/index.shtml (accessed on May 29, 2004). "Survivor: Mark Burnett." USA Today Online (July 19, 2000). http://www.usatoday.com/community/chat/0719burnett.htm (accessed May 29, 2004).